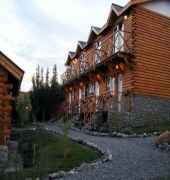 Our aparts and cabins are entirely built in cypress -traditional fine wood from the Patagonian region-, which creates a warm and cozy atmosphere.All units overlook the beautiful Argentino Lake, offering a unique feeling of peace and quiet.Each unit has room for up to five people.Both the apartments and cabins are equipped with satellite television, telephone, microwave oven, cooker, adjustable individual central heating, refrigerator, minibar, complete sets of crockery, cutlery and kitchen utensils, hair-driers in the bathrooms, and bathroom fittings and faucets by Rocca.All bedrooms are permanently heated and beds are fitted with prime quality double mattresses and warm, light bedspreads. The comfort and freedom of the apart system, currently used all over the world and quite different from conventional hotels, will make visitors feel as if they were in the privacy of their own homes. Private parking.